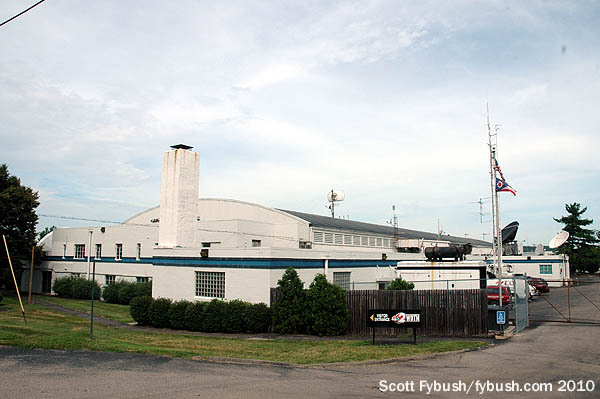 There’s much more to Dayton, Ohio than just the annual Hamvention, which starts in just two weeks. 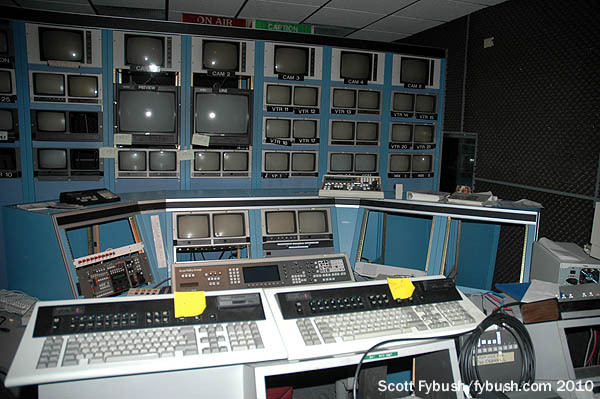 This smallish city in southwest Ohio has lots of broadcast history, too – a history we began chronicling here in December 2010, when we presented a look at the now-former studios of Cox’s WHIO radio and television. 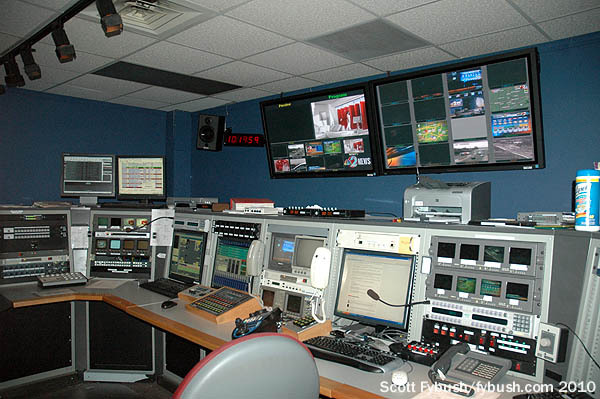 That tour was just one part of a very busy day in July 2010 that found us visiting most of Dayton’s other TV stations and one radio cluster, too, and we’re delighted to show you those tours this week and next. We start this installment on the west side of Dayton, where all of the market’s TV towers sit in a line up and down South Gettysburg Road and neighboring Soldiers Home-West Carrollton Road. Two of these towers have (or at least had) studios at their bases, and our tour begins at the oldest of those. Dayton’s channel 22 signed on in 1964 as independent WONE-TV but quickly became an ABC affiliate a WKEF. The callsign stood for Katharine E. Flynn, who was the secretary to William L. Putnam, the head of Springfield Television, which owned another channel 22, WWLP-TV in Springfield, Massachusetts. WWLP and WKEF shared the same “22” logo for many years, remaining sister stations until new ownership finally split them up in the 1990s. WKEF bounced around from ABC to NBC in 1980, then back to ABC in 2004. 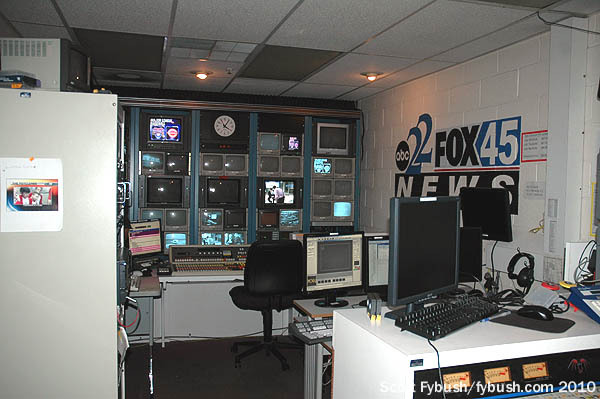 By then it was part of a Sinclair-controlled duopoly along with Fox affiliate WRGT (Channel 45), and when we finally made it over for a tour in 2010, we found an interestingly split operation: the newsroom, studio and master control for both WKEF and WRGT were in the old WKEF building on Soldiers Field-West Carrollton Road near the south end of the tower farm, while the stations’ business and sales offices were in the old WRGT building at “45 Broadcast Plaza” off South Gettysburg Road. 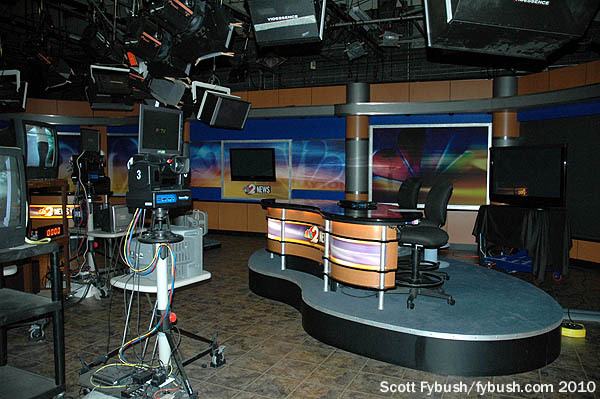 The news set for both stations was tucked into a corner of the old WKEF studio, most of which had by then become the newsroom for both stations. 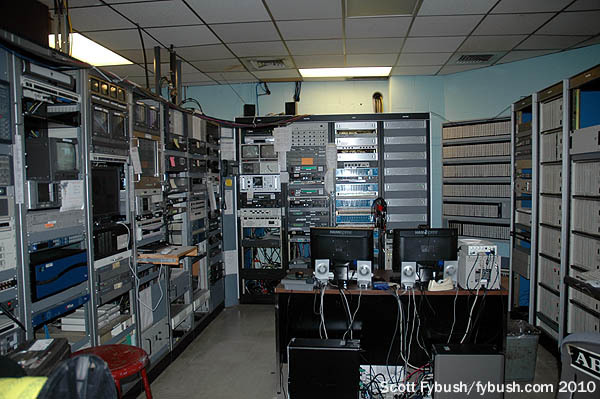 The old WKEF analog transmitter was gone from the master control area, and the 1095-foot tower out back held only a defunct channel 22 analog antenna and a panel antenna for Main Line Broadcasting’s WROU (92.1 West Carrollton). 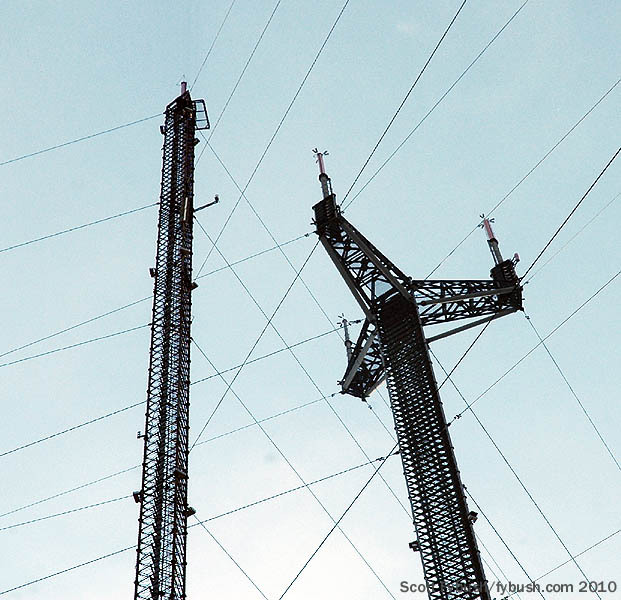 Where did the WKEF transmitter go? 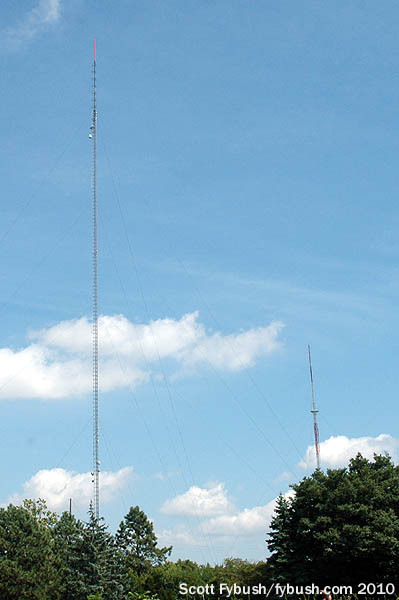 With the DTV conversion, it moved about a third of a mile northeast to the WRGT site, where a second tall tower (crowned by a candelabra) went up next to the original WRGT analog tower, both of them about 1150 feet tall. 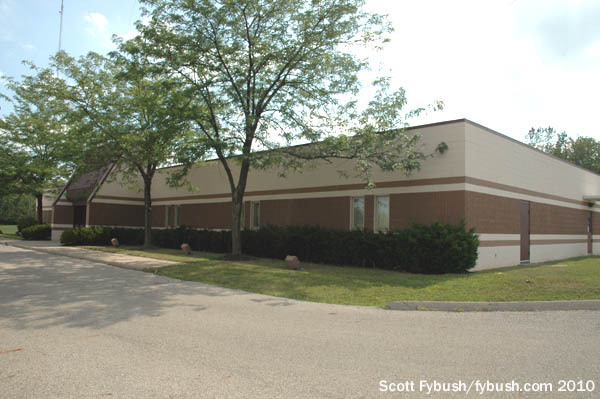 A new transmitter building next to the old WRGT office building housed (and still houses) both WKEF (RF 51) and WRGT (RF 30), as well as WBDT (Channel 26/RF 26), the CW affiliate licensed to Springfield, Ohio. 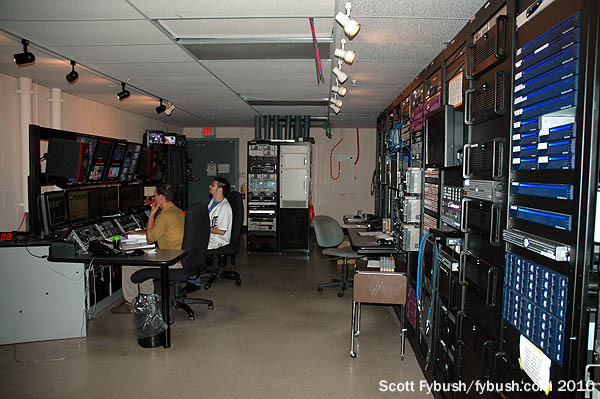 WBDT, as it turns out, plays an interesting role in both the WKEF/WRGT story and in the story of the other station featured on this tour, WDTN (Channel 2/RF 50). 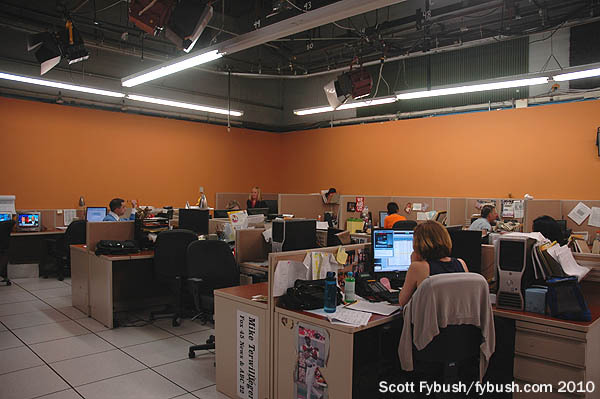 That’s because right around the time we were visiting in 2010, WDTN’s owner, LIN, was in the process of taking over WBDT’s operations. We’ll pause for a moment here to talk about the rest of the tower lineup in the farm. There are two more sites down at the south end of the farm near the old WKEF site and the WKEF/WRGT digital facility. 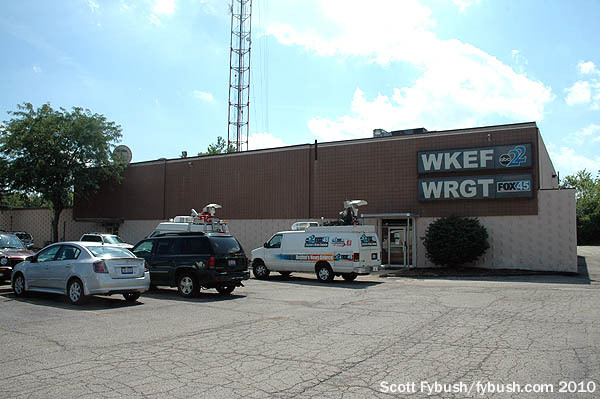 Whether you’re going south on Soldiers Home-West Carrollton Road from WKEF or on South Gettysburg Avenue from WRGT, you end up at Frytown Road – and it’s right there that you find the site of WDTN (Channel 2/RF 50). There are two towers here: a 1010-footer that’s home to WDTN’s digital antenna (and the last analog channel 2 facility) and a 459-footer that was the original tower going all the way back to 1949, when the station started out on channel 5 as WLWD, the Dayton outlet of Crosley Broadcasting. Going back up South Gettysburg Avenue, before we get to WRGT on the west side of the road, we pass the 1132-foot tower of Dayton’s public TV station, WPTD (Channel 16/RF 16), also home to public radio station WDPR (88.1). When WPTD came on the air in 1972 as WOET, it filled a vacant channel that had briefly operated commercially in the late 1960s as WKTR-TV, licensed to the Dayton suburb of Kettering. 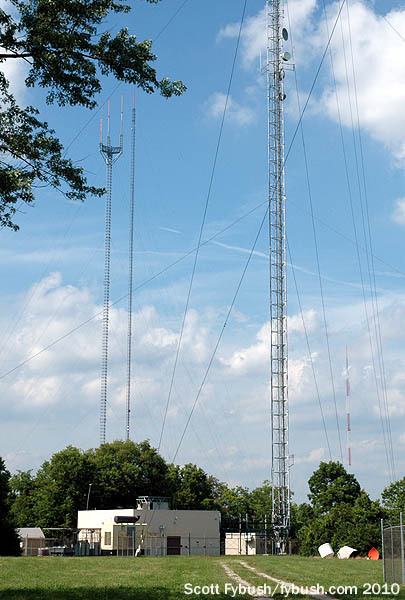 And if you continue north on Gettysburg for another mile or so to Germantown Street (Ohio 4) and turn right, you come to the 1953-vintage 1098′ tower that’s home to WHIO-TV (Channel 7/RF 41) and sister FM station WHKO (99.1). The building apparently started out as a roller rink, and it still looks a bit like one from the outside. On the inside, it’s a classic: upstairs, there’s a tech center where master control used to be located (as a LIN-owned station, WDTN’s master control is now at the hubbed facility at Indianapolis’ WISH-TV); above the drop ceiling, we’re told you can still see the original arched roof of the roller rink. The old news control room upstairs was being dismantled when we visited, replaced by a new digital control room that had recently gone into use downstairs, across the hall from the fairly spacious newsroom. 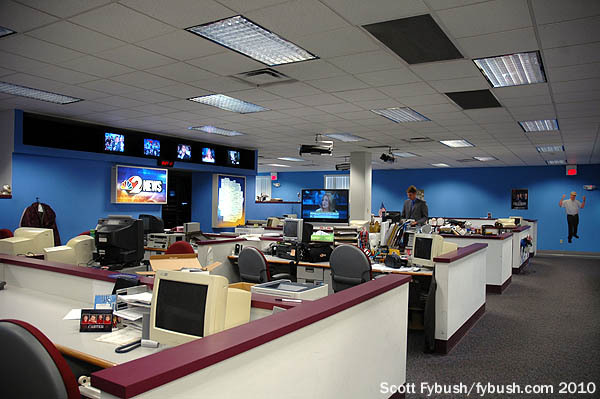 The longtime pecking order in Dayton TV news had channel 2 nestled almost permanently in second place, behind market leader WHIO-TV and well ahead of perennial last-place WKEF/WRGT, and from what we hear, that didn’t change much when WDTN and WKEF swapped affiliations in 2004, returning channel 2 to NBC after a quarter-century with ABC. 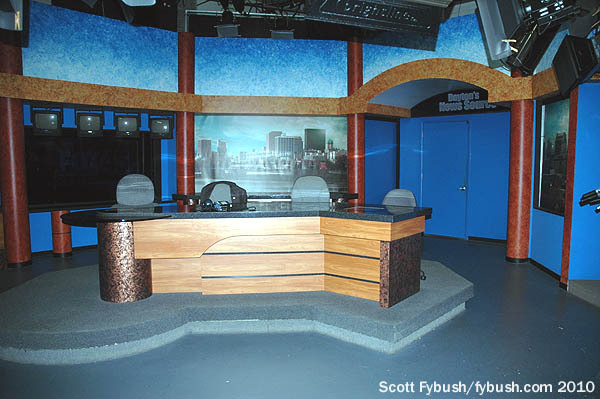 The news studio is also downstairs, just down the hall from the newsroom and control room; in addition to the WDTN newscasts at all the usual times, WDTN was also producing a 10 PM newscast for WBDT as far back as 1997, long before the CW affiliate came under LIN’s management and moved into this building. One more thing about WDTN before we close out this week’s installment: back in the WLWD days, this station was home to a promising young talk host named Phil Donahue, who started his show right here in Dayton in 1967 before going national in 1970. Thanks to Sinclair’s Richard King and WDTN’s Jim Atkinson and Donald Jones for the tours, and to Mike Fitzpatrick for driving! And don’t miss more Dayton legal IDs next Wednesday, over at our sister site, TopHour.com! WKTR-16 was also around 1970-71 or so Dayton’s ABC affiliate while 22 was quasi-independent, though it carried some second tier NBC shows,,financial problems forced 16 off the air by 1972..
Yeah, that, too! It was a very hot July trip. Hi Scott. 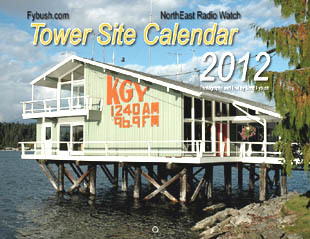 Thanks for the nod on the annual Hamvention. Been licensed for 31 years this June and I have yet to go there. Always enjoy reading your site. WLW-C in Columbus, and WLW-I in Indianapolis (first TV home of Dave Letterman). Cincinnati was home to the Crosley-simulcast daily “Paul Dixon Show” at 9am, and THe Ruth Lyons Show at noon (each 90 minutes). WLW radio simulcast the Ruth Lyons show. The crossownership among WLW-T, WLW-D and WLW-C forced the Dayton and Columbus stations to operate with reduced power for many years to avoid excessive signal overlap. 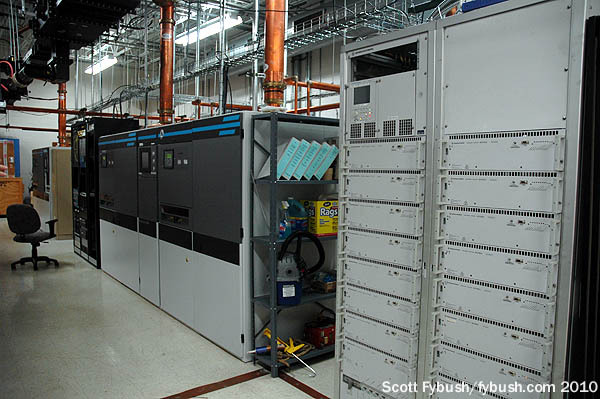 WLW-D/WDTN and WLW-C/WCMH were both able to significantly increase power and antenna height when AVCO sold them. I remember Donahue from his Dayton days. But your dates are slightly off. He did start there in 1967, but when Avco began syndicating his show in 1969, he was still in Dayton. Even there, he managed to land some big-name guests. He didn’t move to Chicago until the spring of 1974. The then-WLWD was also home to the man who preceded Donahue, Johnny Gilbert. He had a show for a year or two in ’66-’67. Avco apparently hoped to make him into another Mike Douglas. That effort didn’t pan out, and Gilbert wanted to move to LA and resume his career as an announcer and game show host, so they went with Donahue, who had previously been a newscaster for WHIO-TV and talk host for WHIO radio.